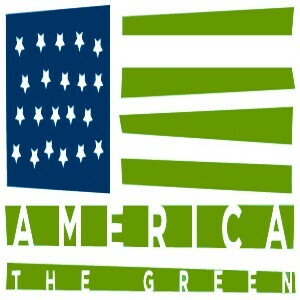 The Environmental Protection Agency has been kind enough to begin sending out regular e-mail updates with press releases about actions difference agencies in the administration are doing to move us forward on sustainability. Below are a few highlights from the e-mail. Develop a U.S. strategy to support international adaptation that leverages resources across the Federal Governmentto help developing countries reduce their vulnerability to climate change through programs that are consistent with the core principles and objectives of the President’s new Global Development Policy. The Task Force will continue to meet over the next year as an interagency forum for discussing the Federal Government’s adaptation approach and to support and monitor the implementation of recommended actions in the Progress Report. It will prepare another report in October 2011 that documents progress toward implementing its recommendations and provides additional recommendations for refining the Federal approach to adaptation, as appropriate. The Interagency Climate Change Adaptation Progress Report is available here. Washington – U.S. Energy Secretary Steven Chu today announced a conditional commitment to provide a partial guarantee for a $1.3 billion loan in support of the world’s largest wind farm to date. The loan will finance the Caithness Shepherds Flat wind project, an 845 megawatt wind-powered electrical generating facility in eastern Oregon sponsored by Caithness Energy LLC and General Electric (GE) Energy Financial Services. The Caithness Shepherds Flat wind project consists of 338 wind turbines supplied by GE. The project will use GE’s 2.5xl turbines, which are designed to provide high efficiency and increased reliability, maintainability and grid integration. The wind farm is the first in North America to deploy these turbines, which have been used in Europe and Asia. Once completed, the project will sell 100 percent of the power generated to Southern California Edison through 20-year fixed price power purchase agreements. The wind facility will avoid 1,215,991 tons of carbon dioxide per year, equivalent to the annual greenhouse gas emissions from 212,141 passenger vehicles. According to Caithness, the project will directly create 400 construction jobs, followed by 35 permanent jobs on site. The Caithness Shepherds Flat project is the largest project to date to receive an offer of a conditional commitment for a loan guarantee under the Financial Institution Partnership Program (FIPP), a Department of Energy program supported by the American Recovery and Reinvestment Act. In a FIPP financing, the Department of Energy guarantees up to 80 percent of a loan provided to a renewable energy project by qualified financial institutions. The $1.3 billion loan is expected to be funded by a group of institutional investors and commercial banks led by Citi, as lender-applicant and joint lead arranger, and three other joint lead arrangers, the Bank of Tokyo-Mitsubishi UFJ, Ltd., RBS Securities and WestLB Securities Inc.
For more information, please visit http://www.lgprogram.energy.gov. WASHINGTON – In an effort to improve environmental literacy and stewardship across the country, the U.S. Environmental Protection Agency (EPA) has awarded more than $1.5 million in grants to 14 organizations in 11 states and the District of Columbia. The organizations will use the money to fund environmental education efforts, which work to inform the public of environmental issues and help them make educated choices on actions they can take to reduce negative environmental impacts. The Native Wellness Institute of Portland, Ore. received $102,000 to implement the “Native Youth Environment Warriors” project, which will provide environmental education and leadership training and support to native youth and their community mentors to design and implement environmental projects in their tribal communities. The Island Institute of Rockland, Maine received nearly $124,000 for the “Energy for Maine” project, which includes community discussions and analysis of renewable energy sources. The project is aiming to increase home and school energy efficiency through student/teacher, and family-generated solutions for reducing energy consumption. The annual awards are given to nonprofit organizations, government agencies, community groups, schools and universities. The recipients of the 2010 competition represent a mix of organizations addressing a variety of environmental issues from climate change to water quality, and dealing with local, regional, or national issues. EPA awards the funds under the 1990 National Environmental Education Act, which gives the agency the authority to support and create environmental education programs nationwide. WASHINGTON – The U.S. Environmental Protection Agency (EPA) has awarded $1.9 million in environmental justice grants to 76 non-profit organizations and local governments working on environmental justice issues nationwide. The grants are designed to help communities understand and address environmental challenges and create self-sustaining, community-based partnerships focused on improving human health and the environment at the local level. The grant program supports Administrator Lisa P. Jackson’s priority to expand the conversation on environmentalism and work for environmental justice. The principles of environmental justice uphold the idea that all communities overburdened by pollution – particularly minority, low income and indigenous communities – deserve the same degree of protection from environmental and health hazards, equal access to the decision-making process and a healthy environment in which to live, learn, and work. In addition to the traditional criteria, EPA encouraged applications focused on addressing the disproportionate impacts of climate change in communities by emphasizing climate equity, energy efficiency, renewable energy, local green economy, and green jobs capacity building. Grantee projects include trainings for local residents to increase recycling, avoiding heat stroke, improving indoor air quality, reducing carbon emissions through weatherization, and green jobs training programs. Since 1994, the Environmental Justice Small Grants program has provided more than $21 million in funding to community-based nonprofit organizations and local governments working to address environmental justice issues in more than 1,200 communities. The $1.9 million in grant funding announced today is the largest amount of total funding in one year for environmental justice grants in more than a decade. The grant awards represent EPA’s commitment to promoting community-based actions to address environmental justice issues. 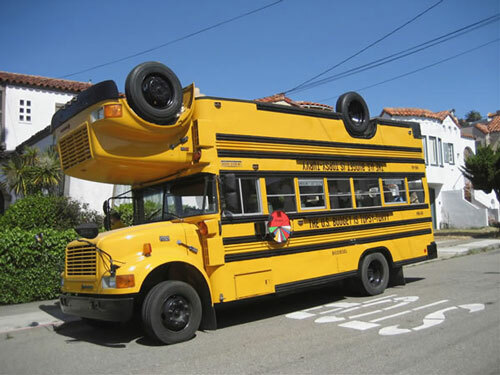 A bus with an interesting design(a bus upside down on a bus) that travels the country educating Jewish youth about sustainability stopped by the University of Maryland Campus yesterday. Here’s the article from the Diamondback, along with a few excerpts below. “The bus contained a few beds and a long table that held a filtering device used to help run the bus on its unusual fuel. The bus was painted on the sides with the Teva Learning Center emblem along with those of other Jewish environmental groups. “Sarah Levine, a senior Jewish studies major, also enjoyed the tour and saw a deeper meaning in the environmentally friendly bus. “I think that the Teva bus is a symbol for change towards Jewish environmentalism,” Levine said. I have a column out today in the Diamondback explaining why the University of Maryland shouldn’t include its Engaged University program in its budget cuts. I’ve always been amazed at how the little things in our lives can add up to make a difference. As a runner, when I’m training for a long-distance race, eating a little bit healthier allows me to hit a time I would otherwise barely miss. The pop quiz I didn’t take seriously ends up being the 1 percent I could’ve used to get a higher grade. The sport or instrument we play can shape us even if it’s just a hobby. This past summer, I was meeting a friend of mine for lunch, and she asked if we could stop by Engaged University. Apparently Rep. Steny Hoyer (D-Md.) was making a visit. I had heard of Engaged University, but really didn’t know what it was or what it did. I had talked to students who volunteered there before, but was never filled in on how important it was until now. Engaged University, a part of the university’s statewide Cooperative Extension system that is located within the College of Agriculture and Natural Resources and based in Riverdale, is in danger of losing university funding. There were three parts of the program that Hoyer visited along with other spectators. First was the Master Peace Community Farm, a garden divided into four segments that includes included an urban farm, family-run plots, and one for youth overseen by local middle and high school students. I found the youth plot the most interesting, as there were some kids working on it during the visit. They were asking Hoyer questions about the value of locally grown food as a fuel-saver because it doesn’t have to be shipped, and asking why their school lunches didn’t include healthy food like they were growing. The second part was the Renaissance Community Youth Bike Shop, which repairs and refurbishes abandoned bikes from the campus and community. The shop teaches kids how to make these repairs and gives away free bicycles for kids who volunteer their time. It was promoting alternative transportation, exercise, teaching new skills, and teaching the value of reusing and recycling. It would be helpful if more kids had places like Engaged University to go to during the summer and after school. To his credit Hoyer hopped onto a pedal powered electricity generator and lit up light bulbs behind him. The last stop was a biodiesel fueling station, powered by a small wind turbine and a solar panel. Engaged U makes the biodiesel from waste vegetable oil, and uses it to serve about 30 people in the community who are part of a biodiesel co-op. If this were adopted in more communities on a larger scale, I could see it playing a role in reducing our oil dependence. I watched the visitors drive away. Then it clicked. The purpose of EU is to provide members of the surrounding community knowledge and resources for improving their quality of life. It’s to serve as a testing ground for solutions to challenges our country faces, put into practice by ordinary people. There are some things you can’t teach inside a classroom. There are some things you have to see and do to understand their value. These are the intangibles in our society. The little things that add up to make or break us. Don’t throw this one away. As a college student, I can attest that this is happening at my university, with new majors and minors related to sustainability, the environment, and clean energy are being created. USA Today has an article which talks about this change and gives a lot of good examples. I’m reposting below. Students interested in pursuing a job in sustainability now can choose from a variety of “green” degree programs. With an increased interest in the environment and growth in the “green collar” job sector, colleges and universities are beginning to incorporate sustainability into their programs. From MBAs in sustainable-business practices to programs that give students the technical training necessary to operate wind turbines, students have an increasing array of options to choose from. Concern for the environment is the motivation, says Julian Dautremont-Smith of the Association for Sustainability in Higher Education. David Soto of The Princeton Review says student interest is driving colleges to create programs that offer training in sustainability. Two-thirds of students surveyed for the company’s recent “College Hopes and Worries” survey said a college’s “environmental commitment” would be a factor in where they applied. “Students are really savvy shoppers these days, so they’re realizing, with a changing economy and green jobs looking to take a leap within the next couple of years, that they want to be armed with those types of skills,” Soto says. One popular program is an MBA that teaches skills for operating sustainable businesses. A University of Pennsylvania program that started this year lets students earn an MBA and a master’s in environmental studies at the same time. “There’s an increasing interest among businesses to take the environment seriously,” says Eric Orts, director of the Wharton School‘s Initiative for Global Environmental Leadership at Penn. “Our take is you really need to have the science background and some other approaches that are not normally taught in the business school context,” he says. Architecture schools are responding to the increased interest in energy-efficient buildings. Christoph Reinhart, associate professor of architectural technology at Harvard’s Graduate School of Design, says the school’s decision last summer to start offering a concentration in sustainable design was driven by interest from students and changes in the field. Arizona State University’s School of Sustainability graduated its first class in May. The school offers a bachelor of arts and a bachelor of science in sustainability as well as a graduate degree. Charles Redman, the director of the School of Sustainability, says the school takes an interdisciplinary approach. Student Drew Bryck says what drew him to the school was the opportunity to study biology, economics and a variety of other fields. Bryck says he is “fairly confident” his degree will help him land a job because the need for people with a well-rounded background in sustainability is growing, especially in the private sector. The program resonates with students, Redman says; 300 undergraduates enrolled the first year it was offered. Bucknell University in Lewisburg, Pa., will require all students to take at least one class that explores the human connection to the environment. Dina El-Mogazi, director of the Campus Greening Initiative, says courses in a variety of disciplines will fulfill the requirement. “We feel that it’s very important, given the current state of the world, that students understand both the way the environment supports human life and the way human decisions” affect the environment’s ability to function. A growing number of schools, including community colleges, are training students to operate green technology. Kalamazoo (Mich.) Valley Community College will offer a 26-week program starting in October to train students in operating wind turbines. Jim DeHaven, vice president for economic and business development at the college, says the school is offering the program to meet the needs of wind farms that are “scrambling” for trained technicians. 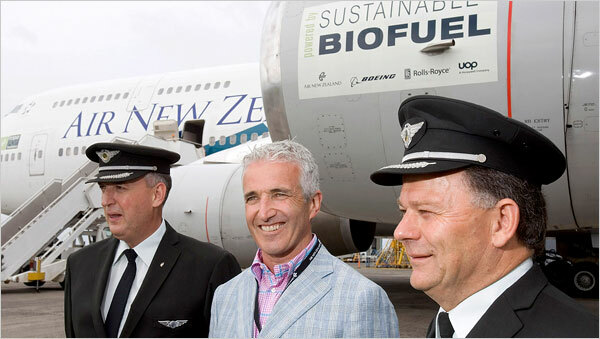 I want to share a neat article in the NY Times about an airline in New Zealand which test ran one of it’s 747’s on 50% biofuels from a plant called the jatropha plant. This plant seems to be one of the more ideal types of biofuels because of how easily it can be grown and how much fuel you can yield from it. I think airlines should be looking at how to reduce their dependency on oil as a top priority since oil prices will go back up. The airline which doesn’t feel that as badly in their bottom line will have a huge advantage in the industry. A lot of passengers would also prefer to fly on the greenest airline so long as the cost is reasonable.